There were many times while reading Chief Complaint: Brain Tumor in which I wasn't sure whether to laugh or cry. That is because John Kerastas tells the story of his run-in with a rather tenacious tumor in a particularly irreverent vein. Kerastas uses large doses of "gallows humor" to tell his story. I appreciated this style, because I have found in dealing with the trials of my own life that laughing about a situation is usually better than crying about it. Recently, Boo and I riffed on the "seven dwarves of asthma": Sneezy, Coughy, Gaspy, Chokey, Wheezy, Snotty and Phlegmy. So you can see why I would enjoy this book. I think I learned that a health issue isn't something to be hidden or to be embarrassed about. If they are really your friends, they want to know at the earliest moment. If they aren't your friends, don't worry about what they think." I have found this statement to be true of any life changing moment in one's life. My true friends are the ones that have stood by me through all of the cataclysmic events of the past few years. I wish I had told them what was going on sooner. Their support has been amazing and I could have used it sooner. 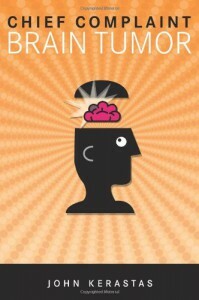 Chief Complaint: Brain Tumor is a book for anyone who has suffered or is suffering with massive upheaval in their life, especially if they appreciate a little humor with their trauma.